CryptoVue is a website which has no info description on its home page. However, clicking on “What’s this?” which is a link at the top of the home page, takes you to another page which displays a detailed info about crypto-currency and Vue. It gives the history of crypto-currency, first mentioning its year of emergence with the first decentralized cryptocurrency- Bitcoin. 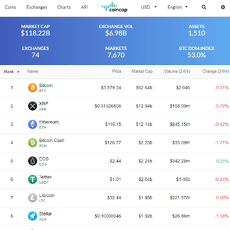 It also informs users that more than 700 crypto-currencies are in existence, and that the total market capitalization is higher than 100 billion USD. 3. At the bottom of the home page, is an info concerning the maker of the site and the year of creation.